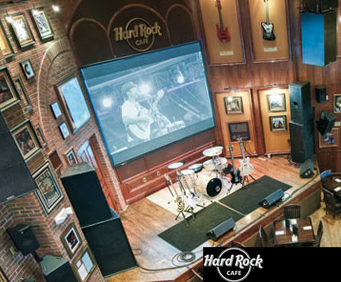 Enjoy a scrumptious, filling meal at the Hard Rock Cafe in Downtown Memphis as you dine amongst instruments, personal items, and other memorabilia from your favorite artists, including Elvis, Johnny Cash, Isaac Hayes, Maroon 5 and many others! There's a reason Memphis is mentioned in so many songs. The city is home to two famous recording studios, Sun Records and Stax Records, and is one of the leading cities in discovering new talent. Memphis practically invented blues, soul and rock 'n roll, sounds that still fill the city streets today. 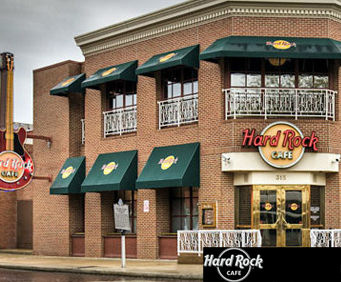 When you're in the area, "Walking in Memphis," make sure you stop by the Hard Rock Cafe. This casual dining atmosphere will keep you entertained all throughout your visit, while you wait for your order, as you sink your teeth into the delicious meal and as you rest a little while your food settles in comfortably. You'll be sitting among memorabilia from all of your favorite artists from throughout the years. 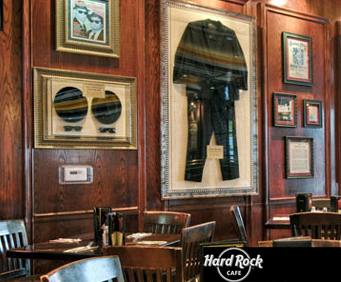 The denim jacket Elvis Presley wore in "Jailhouse Rock," the black leather belt and gun holster of Johnny Cash, a suit worn by Isaac Hayes, the Taylor Acoustic that rarely left Adam Levine of Maroon 5's side for two years and more all cover the walls of the restaurant. 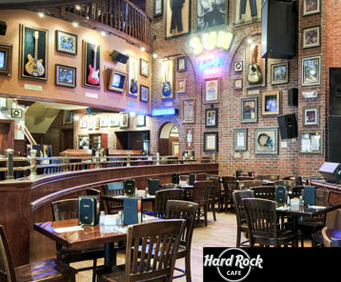 You'll be sitting among artifacts from musical history as you dine on a famed, mouthwatering cheeseburger. The cafe also hosts various events, from concerts to "Memphis Music Mondays" and "Lil' Rocker Tuesdays." You won't want to miss out on a second of this great entertainment and delicious dining, all wrapped up into one fantastic experience. Food was good. Location left something to be desired. Very good service. The food was good except seasoned a little highly for my taste. Has a very good atmosphere.